This section contains settings related to screen-space materials. Postprocess materials applied before all other Unigine postprocess (such as Bloom, Exposure, DOF, etc.) are rendered. Several comma-separated materials (without whitespaces) can be specified. Custom postprocesses can also be set. 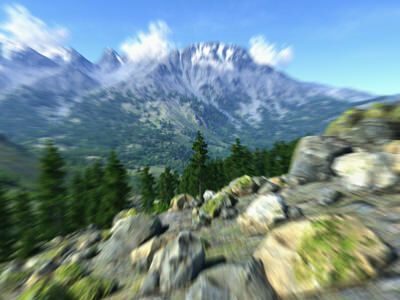 For example, if post_blur_radial is set here, radial blurring will be applied first. Custom composite materials, that are used for final screen composition instead of the default ones. Several comma-separated materials (without whitespaces) can be specified. Postprocess materials applied after all other postprocess (such as Bloom, Exposure, DOF, etc.) are rendered. Such postprocesses, when applied to the screen image, affect glowing areas and so on. Several comma-separated materials (without whitespaces) can be specified. Custom postprocesses can also be set. Here is an example with post_blur_radial material. Materials that are used for debugging the image generation stages. Using such materials helps to investigate the cause of an artifact. 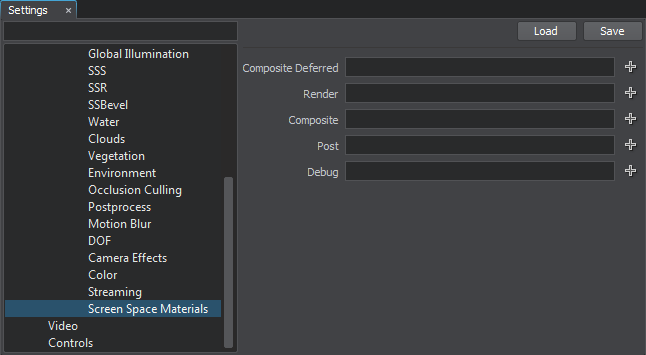 To enable rendering of the debug materials, in the main menu, choose Rendering -> Features -> Debug. The debug materials have the higher priority than the Rendering debug settings. You can create a custom debug material, which, for example, will render only albedo color and highlights of the scene.